​Connect to young readers with dynamic classroom visits. When Kelly Milner Halls arrived for a school visit, the librarian warned her about a quirky third grader who would be at every one of her six sessions that day. He had checked out only one book each week: Milner Halls’ Tales of the Cryptids: Mysterious Creatures That May or May Not Exist. Schools across the country pay for dynamic speakers to offer presentations to small and large groups. With thousands of authors eager to connect with their audiences, how can you ensure that your performance stands out as more thrilling than the Kidizoom Smartwatch DX? Preparation is keyPicture book author Kim Norman runs a blog called Cool School Visits. When she receives contact information for a school’s event coordinator, she sends guides to her books with activities that teachers can do before or after her visit. She offers a poster that coordinators can download from her site and bookmarks for distribution. She also provides a video compilation of book-cover images and pictures of her Newfoundland dog for organizers to run as students assemble for her presentation. Biedrzycki visits more than 60 schools a year and engages students with real-time creations of digital art on a laptop and graphic tablet. Milner Halls, whose topics are far-ranging, shows a PowerPoint presentation as she talks. She brings fossils and artifacts for students to touch. “I engage at least three of their senses, connecting with kids who learn in different ways,” she says. Melissa Hart is the author of Wild Within: How Rescuing Owls Inspired a Family and Avenging the Owl. 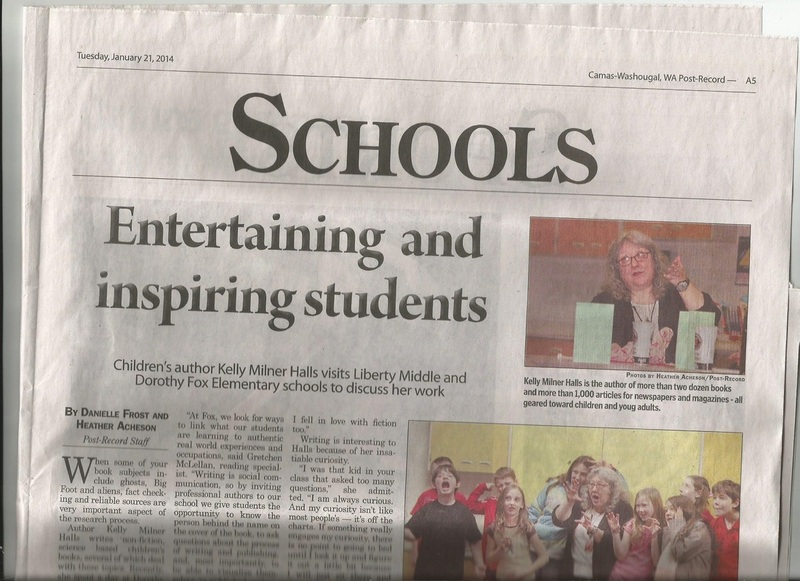 BONNERS FERRY — The students of Valley View Elementary School and it’s staff welcomed the renowned author of children’s books and magazine articles, Kelly Milner Halls, on Thursday, Jan. 25, after having to reschedule from Wednesday’s school cancellation due to the winter weather. Halls lives in Spokane, Wash., and through her writing and presentations, she has brought children both local and far away the idea to ask questions, and seek the answers. During her presentation, Halls gave the children an idea. The idea was to question, and to seek the answers, no matter how vague the clues may be. According to Halls, the most interesting stories that she has written are the Bigfoot stories. Halls chose to write according to how she sees the world. She formulates questions, and proceeds to find the answers. 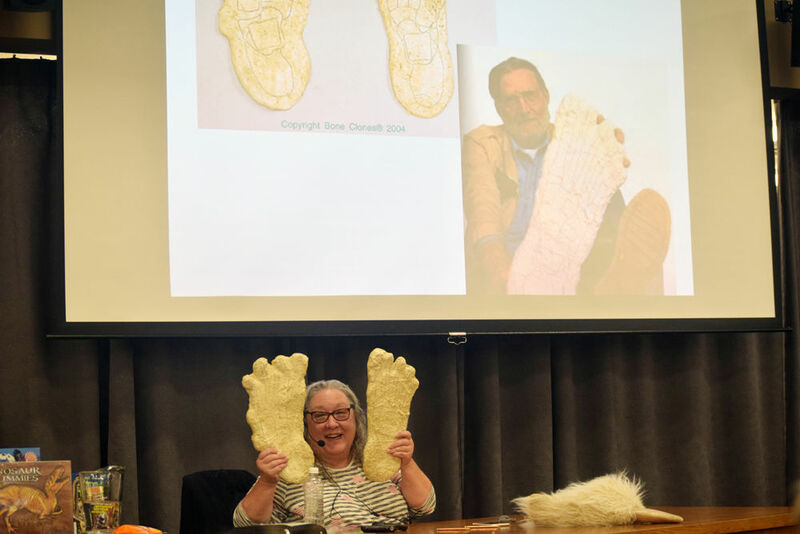 During her presentation, Halls showed the younger classes molds of Bigfoots footprint, and allowed them to decide which was fake, and which could be real. One print was just like a human foot and one was more deformed with bulges coming out of the side. She questioned the class asking if someone would make a fake print that had a deformity, which opened the discussion about deciphering between real and fake evidence. Halls concluded the presentation challenging the kids to ask a question, find evidence, and in the end find the answer. Halls wrote a couple of books under the National Geographic logo, each three stories in one, and both about animal rescue stories. She has herself adopted rescue animals, and showcases them in her presentation to the children. She used a Powerpoint presentation complete with photos to show students not only how adopting a pet is beneficial, but how adopting her animals have affected her personally, showcasing the about four foot iguana, among her other adopted pets including cats and dogs. Halls wanted to produce books that were affordable for the children when she did school visits. There are two ways to produce books — one is work for hire, which gives the author a one-time payment and the books sold through that company are more inexpensive to the buyer. The second way is royalty books, which enables the author to make an amount for each book sold, but tend to cost the buyer a little more. “There are so many kids that wanted a book and couldn’t afford a book, so that’s why I did it when National Geographic called,” said Hall, speaking of the companies’ offer. Halls temporarily left behind a few books for sale for the children that were unable to purchase one during her visit, as well, and they are located in the library at Valley View Elementary School. A friend of Halls works for Microsoft, and came to her with the idea of doing a video series about weird stuff. Together they produced a pilot and presented it to MSN, who accepted the idea. In August, they plan to shoot 10 episodes of Kelly’s Curiosities which will be produced as a web series. 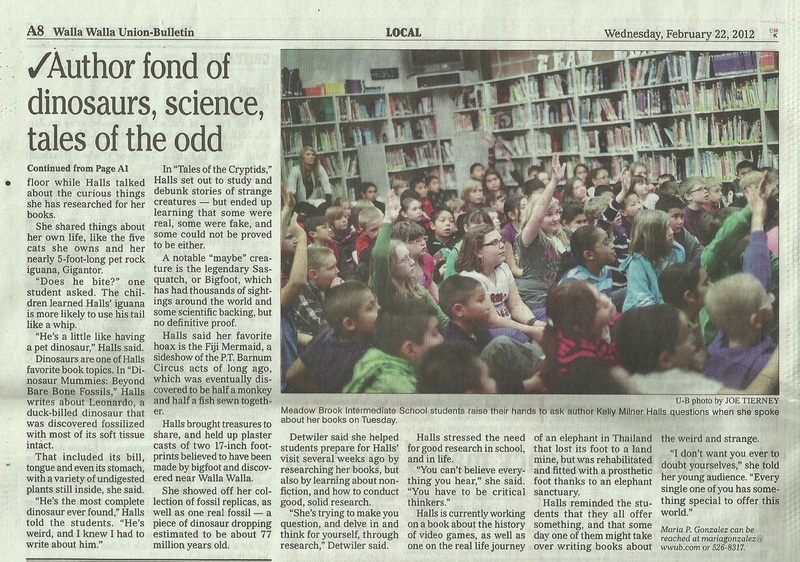 “It’s about weirdly wonderful topics like asteroids, dinosaur poop, mortuary tools and more,” said Hall’s website. On her website are links to what has been produced so far. “When I decided to write, I decided to write the books I would have loved,” said Halls. Growing up a tomboy who loved to find rocks and catch frogs to scare her sister with, the topics of her books are outside the box, but interesting to young readers. 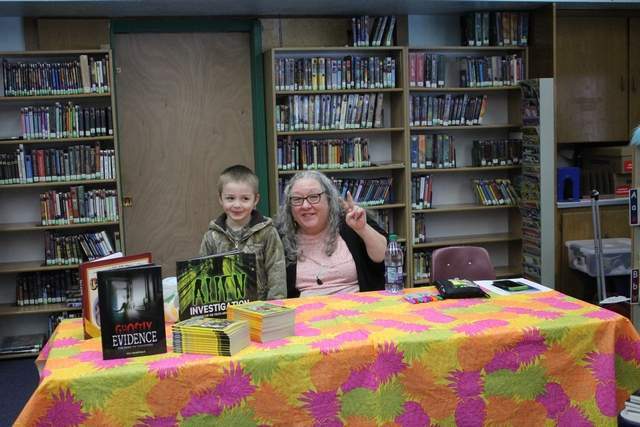 Being kid oriented, Halls kept the audience captivated and involved with the presentation, as well as being sure to talk and listen to the children during her book signing, even though she was on a time limit. “Kelly was great! Easy to work with, even staying an extra day for us. I’ve had inspiring feedback about her assemblies, and the kids are still talking about her,” exclaimed the schools librarian, Julie Colson. 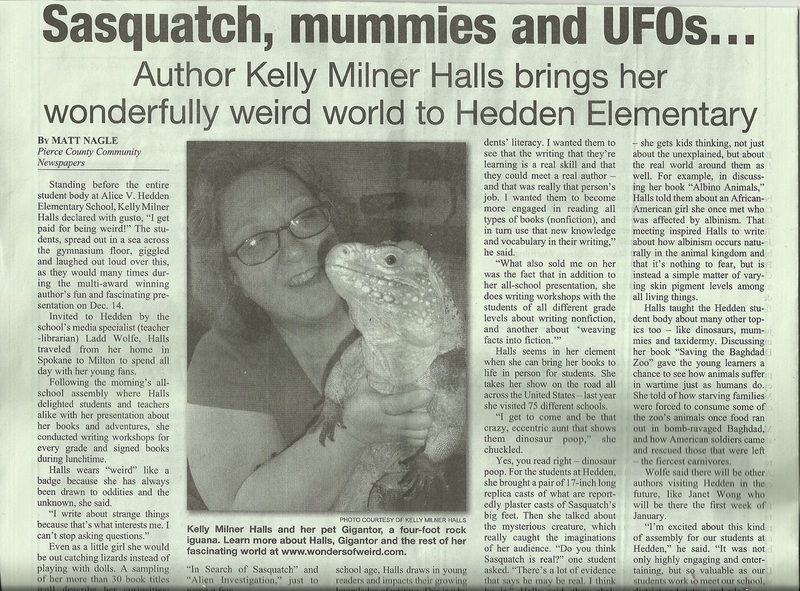 Children’s author Kelly Milner Halls sat behind a table, on which were displayed molds of bigfoot’s footprints and a mask of Mugato, the carnivorous white-furred ape beast of the original “Star Trek” television series. They would come in handy later. 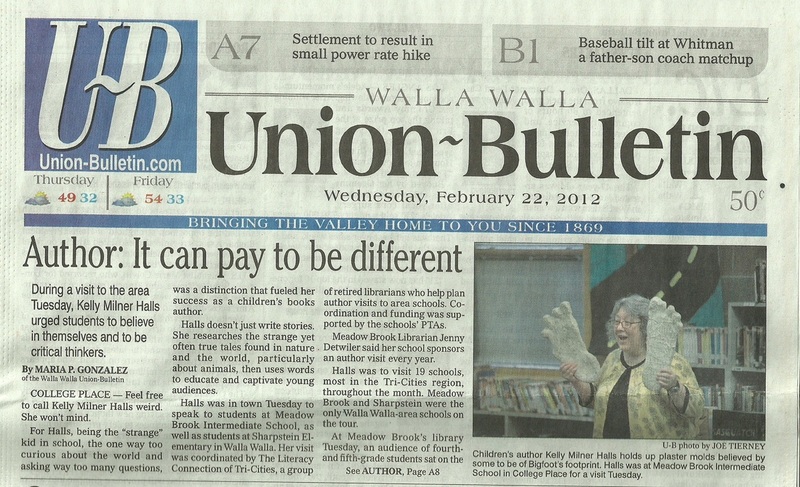 “I get paid for being weird,” she said to the settling crowd of children and parents at Walla Walla Public Library Saturday morning. A substantial portion of her oeuvre stood on a table adjacent, and she was to tell of its making. But first she spoke about herself and her cats — shelter cats. She showed Fluff on the projector screen. “Nobody wanted him because he bites. He still bites, but he bites in our house now,” she said. Also on the screen was a rock iguana, called Gigantor. “Do we know he’s big?” she asked, noting that the picture had no basis by which to tell scale. “We need evidence,” she said, then showed a picture of her holding an evidently gigantic Gigantor in her arms. One time, Gigantor bit her. She didn’t know Gigantor had teeth, but she did some research and learned that in fact they were retractable. Then another story: She was at the Denver zoo and saw a group of black kids, apparently with a white friend. Then she realized the white friend wasn’t white, but rather a person with albinism. She battled the temptation to ask the kid to inquire about the condition and instead returned home and do research. It resulted in a book about albinism, a pigment disorder. She showed pictures of albino squirrels, dolphins and other creatures. “Are you seeing a pattern here — that I always like to look something up?” she told her young listeners sitting with their parents. The second is “critical thinking, so that they can evaluate the evidence for themselves and make up their minds. Especially now because there is so much misinformation floating around — not just about politics but about everything. Milner Halls began her writing career as a journalist, but soon found she lacked the “killer instinct” she said was sometimes called for when reporting on society’s more unsavory and convoluted elements. “I realized if I write for kids I’d never have to do anything mean spirited,” she said. Her dinosaur books emerged out of research she’d done as a freelancer. “Before I went on assignment anywhere I would research what fossils were where,” she said. She says there are not a lot of nonfiction children’s authors out there, fewer still who can hold the attention of a bunch of fourth-graders. Liz George, a librarian at Walla Walla Public Library, said the library is focusing specifically on fourth-graders — “the first year of ‘tweenhood’” — with such events. Milner Halls’ talk, though clearly addressed to children, was not averse to dark and mature undercurrents. As the albinism conversation continued forth, she meditated on her experience learning about the albino salamander. She moved on to the case of Bigfoot, the subject of one of her cryptozoology books, and the purpose of some of her weirder props became clear, serving as evidence to consider. She then she turned to Mugato, the 1967 “Star Trek” television character, which she posited was a costume of significantly lower quality than the Bigfoot in Patterson-Gimlin film. “It’s either a really excellent costume, really before its time,” she said of the Bigfoot, “or it’s an animal,” she said, adding that if she couldn’t prove it was fake she would never tell people it was. She continued, saying some people conclude shooting one will prove it’s real. “I think it’s a bad idea. Because you’d have to shoot a mom or a dad or a kid or a cousin — you know how great apes live in family units? I wouldn’t shoot a family member. COEUR d’ALENE — Baby dinosaurs. Sasquatch. Albino squirrels. Pretty much everything children's author Kelly Milner Halls presented to Fernan STEM Academy students on Friday was received with amazement, amusement and awe. "I like how she likes wildness. I really like it, too," said second-grader Payson Shaw. "It really helps me think critical." Critical thinking was at the core of Halls' critter-centric presentations, which were based on zoology, cryptozoology and mysteries of the natural and supernatural world. Her goal was to plant the seeds of curiosity that would sprout into hunger for knowledge and appetites for accuracy. "When I do research, it's like playing a video game," she said to the second-graders. "Gamers are the most determined kids on the planet. They are also the best problem-solvers because you cannot beat a video game if you don't solve problems and you don't stick to it." Halls is the author of more than 30 books, several nonfiction, that range in topic from animal rescue stories and wild horses to astronauts and science-fair projects. She has been a fan of unusual subjects since she was young and started her writing career studying journalism. "When I was a kid I used to sit on my dad’s lap and watch weird documentaries. We’d watch Loch Ness monster and Bigfoot and space documentaries,” she said. "My dad was a very conservative Republican guy but he was accepting, he allowed me to develop whatever my interests were. “He would say, ‘Let’s look at the evidence,’” she continued. “So I grew up hungry, making him insane, my mom insane asking 10 million questions, making my teachers crazy. Then I realized if I am a journalist, it’s my job to ask questions. It was the perfect place for me." 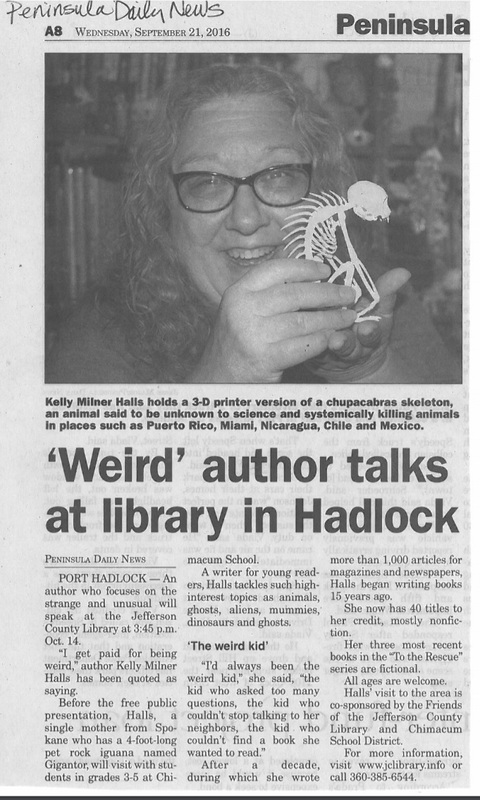 Halls then began writing for kids, giving her an avenue to share that craving for knowledge and love of the strange and unknown with young readers. She brought a few visual aides to embellish her Fernan presentations, including alleged Bigfoot plaster prints and a white Sasquatch-like mask from the early days of "Star Trek." One lucky student, Parker Parisot, got to put the mask on for a moment and laugh along with her schoolmates. “I loved her presentation," Parker said. “It felt really weird when I put on the mask." Halls' author visit was made possible through the Meet the Author! Be An Author! grant Title I reading specialist Shelby Randklev received from the Excel Foundation. Halls is the third author to visit through this program. 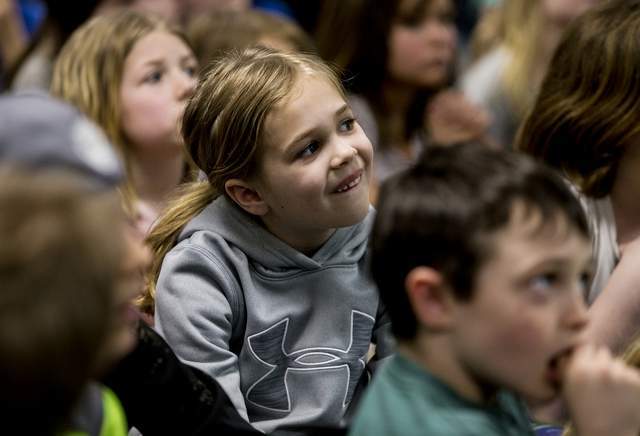 "A lot of our students have never met a real author before, so this was to get them excited about reading and becoming a writer and becoming a thinker," Randklev said. "What I wanted with Kelly was nonfiction and just examining your evidence — what's real, what's not? — and to think critically about the things you read and the things you see and compare multiple views to come up with an educated opinion." Toward the end of Hall's session with the second-graders, she reminded them they are capable of "digging deep" into whatever subjects they care about and maybe someday carrying on the torch as writers of the weird. "Do I seem like a rocket scientist, or do I seem like a weird old grandma who likes to look up facts?" she asked the vocal crowd. "You understand that you can do this too? It's a great job. You have to do weird stuff. I had to dig up a T-Rex once. One time, I had to go swimming with the dolphins. One time I had to do indoor skydiving, and one time I had to pet baby polar bears. Think about doing my job. "You are the next writers. What you care about is important." Photos by Loren Benoit -- Second grader Leah Zahnow reacts to seeing an image of a baby dinosaur at Kelly Milner Halls presentation Friday afternoon at school. Read the full Camas article HERE. For writing about me in print and on your website. Want to know more about the work I do? Patricia's work is a great place to start. Click HERE. Kelly Milner Halls was always the weird kid, "the kid who asked too many questions, the kid who couldn't stop talking to her neighbors, the kid who couldn't find a book she wanted to read," she confesses on her website, www.wondersofweird.com. But when Halls discovered in high school that she could actually write, she channeled her inner weirdness to launch a children's writing career that now includes more than 1,500 articles for publications from Highlights for Children and Teen People to Writers Digest and the Washington Post, as well as a slew of award-winning children's books. Her touchstone topics? Anything weird, and the weirder, the better. Dinosaurs, cryptids, aliens, mummy children, wild dogs—they're all Halls' stock-in-trade and what make her offbeat books especially appealing to reluctant readers, her favorite audience. Her latest volume, In Search of Sasquatch (Houghton Mifflin, 2011), introduces kids to cryptozoology's gentle giant and those folks devoted to proving the legendary creature's existence. Stunning to look at and fascinating to read, the book touches on scientific methods and encourages kids' critical thinking as they ponder the world's mysteries. As Kirkus enthused, In Search of Sasquatch "should give young cryptid hunters a good hairy leg up on investigations of their own." AUTHORLINK: Was this book as much fun to write as it is to read? You obviously have a passion for Bigfoot investigation—how did the book come about? HALLS: In Search of Sasquatch was an absolute joy to write and research. Following Bigfoot hunters around is a real adventure. It's a quest full of thrills and chills and very hopeful expectations. Even when they didn't pan out, the attempts were worthwhile. After all, you're out there in the wilderness, breathing in the atmosphere and the promise of nature. How can that be bad? I did not find any solid evidence of Sasquatch on my very amateur investigations, but the promise of finding something is pretty darned exciting. I can see why the pros do what they do. AUTHORLINK: I see that you conducted scads of interviews yourself. What other kinds of research did you do? How important to you was it to have the text vetted by an anthropologist in the field? HALLS: To prepare for writing In Search of Sasquatch, I read almost a dozen adult nonfiction books—and one adult "nonfiction" book I suspect is pure fiction. I did a lot of fascinating interviews. I attended a Bigfoot conference, and I did a little very amateur fieldwork. I went out "squatching" with friends in Washington State to be sure I had an accurate sense of what the quest is all about, how it feels. I used to do a lot of backpacking in the High Sierras of California in my teens, so I had some outdoor history, but I wanted to be sure. Even so, having [anthropologist and author] Kathy Strain standing by to vet the final manuscript was terribly important to me. I do my best as a journalist to represent things accurately—in this case the investigative work of serious people trying to find Sasquatch. But I'm not the expert. I depend on experts to double-check my work to be sure I didn't misunderstand anything important. Kathy was a huge asset, and I am beyond grateful for her time and notes. If the book is good, it's because of the generosity of experts like Kathy. My books are only as good as the people willing to help me. AUTHORLINK: How have you managed to have the same illustrator, Rick Spears, work on at least four of your books, including Sasquatch, with four different publishers? That's quite a feat! HALLS: I met Rick Spears when I was researching my first trade nonfiction book, Dino-Trekking (Wiley, 1995). He volunteered to illustrate that book for free, and free was exactly my budget. He works full-time for a natural science center and builds life-size, accurate dinosaur models in his spare time. He knows dinosaurs inside and out. When I wrote Dinosaur Mummies (Darby Creek, 2006) I asked my editor, Tanya Dean Anderson, if Rick could do the illustrations. She had already hired another illustrator, so the answer was no. Then the illustrator fell through at the last minute. Rick agreed to finish the job for half the pay in half the time, and did a fantastic job. So Tanya was sold. He did one illustration for Mysteries of the Mummy Kids (Darby Creek, 2007). Then I submitted my proposal for Tales of the Cryptids (Darby Creek, 2006) and asked Tanya if we could use Rick again. She remembered how great he was to work with on Dinosaur Mummies and almost immediately agreed. He nailed it, so when Houghton Mifflin Harcourt agreed to let me do Sasquatch, he seemed like the obvious choice. He also illustrated Alien Investigation, my next book for Millbrook. Wait until you see THOSE alien and UFO illustrations. Love them. AUTHORLINK: When you sold Sasquatch to Houghton Mifflin, did you have a completed manuscript, or did you sell from proposal (one of the many fabulous things about writing nonfiction)? Did you have any idea what the finished product might look like, or was it all a glorious surprise? It's one beautiful book! HALLS: I had a very detailed proposal ready when I approached Houghton Mifflin Harcourt with In Search of Sasquatch. I had hoped it would be a Scientist in the Field book, so I submitted to Erica Zappy, just as any other writer would submit—slush pile. Two or three months passed and I didn't hear back, so I figured the answer was no. Then I got a fantastic email from Erica Zappy asking if the book was still available, wondering how it had been overlooked for all those weeks. I said it was available, she took it to acquisitions, and they bought it. The science was not quite solid enough for it to be a Scientist in the Field book, but they thought it was a great standalone title, and I was delighted either way. Working with such a brilliant editor is a treat, however it unfolds, so I was delighted. I did have to acquire all the photographs for the project, so on some level I could picture possible layouts. But I had no idea how utterly beautiful the finished book would be. Writers are only one element of a vibrant team of professionals who make a book possible. We give them raw materials, the illustrations we've commissioned, but editors and art directors really make the magic happen. They bring the book to life. Then the marketing and sales people step in to bring all that work to the public. Somehow, they make people care about THIS book, when there are hundreds out there competing for attention. This industry is a collaboration of hardworking pros, and I'm so lucky to be part of that team—every time I get to write a new book. AUTHORLINK: You've written tons of award-winning nonfiction for young readers, starting with magazines early in your career. How did you make the leap from selling to magazines to selling to publishing houses? Have you found your career building momentum—does one book sale or great reviews or an award make the next pitch and sale a bit easier? —HALLS HALLS: For about ten years, I wrote magazine and newspaper nonfiction for young readers (or nonfiction about children's books and authors) almost exclusively. I was a single mom with two kids to care for, and I couldn't travel very often. Juggling twelve articles a month fed my family and kept a roof over our heads. But as my children got older, I began to yearn for something a little more lasting. I wanted to write books. I'd written a fictional picture book, two trade nonfiction books, and a couple of work-for-hire projects when Tanya Dean Anderson called me. She'd been my editor at Guideposts for Teens and was launching a brand new publishing house aimed at reaching reluctant readers, Darby Creek Publishing. She asked me if I had anything good, and I mentioned a dinosaur named Leonardo found with 70 percent of its soft tissue fossilized along with its bones. I wrote up a proposal, and Tanya bought it. For the first time, I was allowed to format my nonfiction books very much as I had my magazine articles, because we were trying to engage reluctant readers. In many ways, my nonfiction book career was born with Dinosaur Mummies. And I wrote five more books with Tanya at Darby Creek— each reflecting the writer I am, and the reluctant reader I once was. I'd found my voice and my purpose. Success has made my reach broader—editors are more willing to look at my proposals, perhaps, because I have a track record. But the topics I pick SEEM risky. They sell really well—in part because I do fifty to seventy-five school visits a year to hand-sell them, in part because kids out there are hungry for the kinds of books I write. But I swim upstream in my approach in many ways, and that can be a tough sell at a marketing meeting. So I work hard on every proposal. I hope someday an editor will offer me a three-book deal so I'll have a little job security, but I'll do fine forging ahead one book at a time. I've done it a long time now. 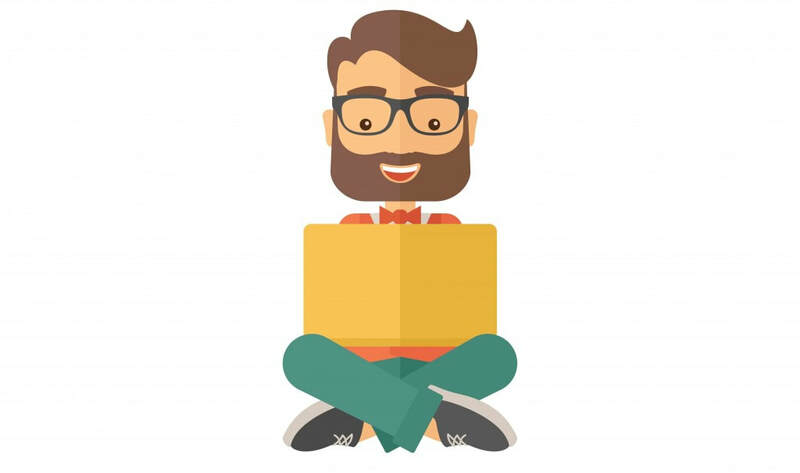 AUTHORLINK: Does a nonfiction writer need an agent? Are agents even interested in children's nonfiction authors? Nonfiction hardly brings in the six figure advances. Is a nonfiction author her own best advocate? —HALLS HALLS: I only signed on with an agent a year ago—Jill Corcoran at the Herman Agency. I got agency owner Ronnie Herman in the deal, too, to my great and grateful surprise. They are both remarkable professionals who work REALLY hard for me. So, yes, having an agent is fantastic—like having a team on your advance team, the same way you have the publishing team in your court after the book is finished. But I did reasonably well on my own too. I had to. Sink or swim is a great motivator, and writing was all I knew how to do. If I didn't succeed, my kids would be homeless. But in the year I've had Jill and Ronnie, I've been enormously comforted by the fact that someone else was working to help me build editorial relationships. Let's put it this way. In my youth, I was a pretty good shortstop because I loved the idea of covering two bases at once. I loved the challenge of doing what seemed impossible. I think I thrived without an agent for the same reason. But I also felt pretty isolated—alone. No one cared if I got a contract. No one cared if I won an award. No one sang my praises unless it was me...and I felt pretty weird blowing my own horn. The minute I signed with Jill and the Herman Agency (September 11, 2010), I had people looking out for me—people who cared about what I was trying to do as a writer. They believed in me, and it made it easier to believe in myself. So, no, it's not mandatory to have an agent if you write nonfiction. It can be done, and I did it a lot of years on my own to some measure of success. But having Jill and Ronnie out there fighting for me is such a huge blessing. That said, not many agents WANT to represent nonfiction, so it's a good thing it's not essential, because I would have starved to death waiting. AUTHORLINK: It's a challenging time for nonfiction authors, what with the instant information available on the Internet and all the new digitally-enhanced, multimedia apps and ebooks. Have you dipped your writerly toes into the digital seas yet? Do you see children's publishers embracing the new technologies or waiting to see how things shake out before moving forward? HALLS: It is a challenging time for all writers, for all publishers, for all industries, truth be told. Everyone is cutting back. But I don't see the digital future as a bad thing, especially not for nonfiction. Nonfiction is especially well suited for digital applications because what we write about is real. I haven't seen my books adapted yet, but I'm excited at the notion. Imagine talking, for example, about the Patterson-Gimlin film, the famed 1967 footage that made Bigfoot famous. Now imagine reading Tales of the Cryptids or In Search of Sasquatch in a digital application, then clicking on that still frame from the film to reveal the full 1:06-minute experience right there on your iPad. I think that's a remarkable concept sure to draw my reluctant readers further into their nonfiction explorations. So I'm excited by the possibilities. I do think the royalties may need a little closer examination to be fair to the writers and the publishers gambling on the success of the books. But I have faith that'll all be decided fairly once the technologies are readily available. I can't wait for the day when my books are in traditional print AND in digital formats. I think both will survive, when the dust has cleared. AUTHORLINK: You have a few other titles out now or soon forthcoming. Can you talk a bit about Alien Investigation, Hatchlings, and the anthology Girl Meets Boy and how they came about? —HALLS HALLS: Alien Investigation is the official follow-up to Tales of the Cryptids. It begins with fictional "What if..." moments, as Cryptids does, followed by chapters of carefully researched nonfiction evidence for and against UFOs and alien encounters. I LOVE this book. I'm so excited about it, I can't wait for it to be released. Kids have been asking me to write this book for years, and I'm excited to deliver it. Kids have been asking for a book about ghosts, too, so that won't be too far behind Aliens, which will be for sale as of January 15, 2012. I get my author copies next month. Hatchlings: Life-Size Baby Dinosaurs is exactly what it seems to be. It's one of only three books I've ever written for very young readers, ages four to seven. Researching another dinosaur project, I discovered that baby dinosaurs were almost always relatively small when they first hatched from their eggs—small enough to fit on the page of a slightly oversized picture book. I thought, "Man, my smaller readers would love to see how little those giants once were." Editor Lisa Cheng at Running Press (Perseus Books) agreed, and it'll be out in April of 2012. I love the illustrations Adam Relf came up with—very compelling, realistic two-page spreads, even though the book is for very young readers. I love the respect that conveys. Those little readers are small, but important. Hatchlings is just for them. Girl Meets Boy (Chronicle, 2011) is a young adult anthology for mature teen readers—and quite a departure for me. I've been good friends with a group of talented YA authors for many years now, and a HUGE fan of YA literature as a reader myself. I came up with the idea of an anthology that would explore how two people can see the same event very differently. So I gathered pairs of prominent YA authors willing to explore those differences. One writer wrote a story about an event from a male or female point of view. His or her partner told the same story from the opposite gender's point of view. The result turned out to be something really special, thanks in large part to the stellar talent of the writers who agreed to participate—James Howe and Ellen Wittlinger, Sara Ryan and Randy Powell, Terry Trueman and Rita Williams-Garcia, Cynthia Leitich-Smith and Joseph Bruchac, Terry Davis and Rebecca Davis, Chris Crutcher and me. I am, by far, the weakest link in the chain, in that this is my first attempt at YA fiction. But with a mentor like Chris Crutcher, how could I lose? It's a daring collection of stories, sure to be challenged—not for my traditional readers ages nine to twelve. But I hope it touches YA readers looking for stories they can sink their teeth in. Nothing would please me more. AUTHORLINK: For many years you've worked as Chris Crutcher's assistant. How did you get that cool gig? And what, exactly, do you do for him? How has your work with him affected your own writing? —HALLS HALLS: Fifteen years ago, I "met" Chris via a telephone interview. I was the executive editor at KidsReads.com, part of the Book Reporter Network. At the time, KidsReads included YA literature, though it later broke off as TeenReads.com. It was my job to write ten book reviews a week AND four special features—two themed book round-ups and two author interviews. My daughter was fourteen and hated to read because her life had been tougher than most teens. The books she was asked to read didn't move her. I was on the lookout for powerful YA writers when I stumbled upon Chris Crutcher's Staying Fat for Sarah Byrnes (Greenwillow, 2003). I knew this was what Kerry had been looking for, and I knew I had to write about the guy who understood kids like mine. We talked for two hours that day, and a professional friendship was born. Several years later, I wrote another piece about him for the Denver Post, then another for our local newspaper, the Spokesman Review. He could never find a current author photo for the editors, and I kept teasing him, telling him he should hire an assistant to keep track of things like that for him. A year or so later, he was going out of town and asked me to organize his files while he was gone. I found an invitation to China in the stacks, a trip just two months away, so I asked him if I could follow up on the trip. He said he was sure everything was set, but sure, I could check it out. I wrote to the contact and asked if they needed anything to prepare for Chris Crutcher's visit; they said they had never heard back from Chris and so had invited another author visitor. When he got back into town, I told him what I'd discovered, and said, "Chris, you REALLY need an assistant to keep track of this stuff." "Okay," he said, "but only if you'll do it." I never meant ME when I made the suggestion, but how could I refuse? That was ten years ago, and I've been his assistant ever since. I keep his professional calendar and coordinate all of his author visits and conference appearances. He gets a request, the request goes to me, and my work begins. Once his hosts and I get all the groundwork completed, he flies out and does the hard part. But I get to help some amazing people bring a talented author to their schools or events with confidence. I make sure they have all the support materials they need, I prepare travel briefings for Chris for each trip, I coordinate press coverage, I handle his website, and, when his girlfriend is busy, I sometimes feed his cats. I also get to help with all the book challenges that are filed against his books—free speech—one of my favorite parts of working for Chris, as a journalist. It's a wonderful job, and I love it—almost as much as I love writing my own books. Working for Chris has taught me so much. For example, my presentations for schools and conferences are really strong in part because I learned how to do them watching Chris. We write very different things, but the connection to our readers is identical. He told me once, "The people who come to hear you speak don't just want to hear about the books. They want to hear about who you are and why you write them. They want to see where the books come from; they want a glimpse of who you are. That connection is what really matters." That advice transformed my whole approach to sharing the work I do. And I'm so grateful for it. He's also mentored me as a fiction writer for several years. My story—a response to his story in Girl Meets Boy—is my first published YA effort, but I am working on my first YA novel, and he's agreed to work with me to make it the best it can be. Believe me, I know how fortunate I am. I won't squander that opportunity. —HALLS HALLS: Other than the YA novel, I'm working on a new YA anthology for Chronicle Books, an animal rescue book for kids ages seven to nine for National Geographic, plus a nonfiction history of video games called Game On, a nonfiction book about a baby elephant impacted by war, and a young reader history of tattoos—all for kids nine and up. There are other projects in the works, but I've got to save something for the next interview. One thing is certain, I'll do my best to keep writing books kids can't wait to dig into. Those topics are the topics that most appeal to me, too. I can't ever see that changing. Susan VanHecke is an author and editor of books for adults and children. Her titles for young people include Raggin' Jazzin' Rockin': A History of American Musical Instrument Makers (Boyds Mills, 2011), Rock 'N' Roll Soldier (HarperCollins, 2009), and An Apple Pie For Dinner (Cavendish, 2009). To find out more about Susan and her books, visit www.susanvanhecke.com and www.susanvanheckeeditorial.com. ​Feature profiling KMH's career as a magazine and newspaper freelance writer. Do you often pose the questions Why? or How? or What s next? If you want to find out the answers, you will enjoy writing nonfiction. This book will help you present intriguing facts with your own personal flair."